The Maya ruins at Palenque are both mysterious and beautiful. Examples of Maya glyphs are found throughout the temples. One building on the site is in fact named the Temple of the Inscriptions. On June 15, 1952, Mexican archaeologists broke though a passageway within the Temple of the Inscriptions at Palenque. They stumbled into an underground crypt holding a limestone sarcophagus. Inside lay the bejeweled body of a ruler of Palenque, his face covered by a haunting jade mask. Who was this great leader? No one knew. They could not read the hieroglyphics carved on the sarcophagus. The Mayas covered their buildings and monuments with fascinating signs called glyphs. They also wrote books. Known as codices, they constructed them from fig tree bark, hammered thin. They coated the surface with lime, then folded it back-and-forth like an accordion. Some codices stretched for more than 20-feet. In 1562, at Mani, Bishop Landa destroyed 5000 Maya idols and burned every book he could find. Only a handful have survived. Glyphs found on the pages of Maya codices, such as the Madrid Codex, help researchers piece together the culture and history of the Mayas. Three As, two Bs, two Xs — it is a curious collection. In the early 1950s a Russian researcher, Yuri Valentinovich Knorosov, figured it out. Bishop Landa had given the name of each Spanish letter and asked his Maya informant to draw its sign. No one took much notice. It was the height of the Cold War and Knorosov was a Communist. Besides the view in the West was that glyphs represented ideas directly. They were "memory-joggers," not words. The next breakthrough came from another Russian, Tania Proskouriakoff, who grew up in the United States. At Piedras Niegras she studied stelae — carved stone slabs — which the Mayas placed at the foot of important buildings. Each showed a figure, presumably a god, seated in a niche. Proskouriakoff noticed a curious pattern of numbers on them: a date, another date accompanied by a Frog glyph, and a third date with a Toothache glyph. Proskouriakoff grasped their significance. Maya words can be written as a single glyph representing the word, a set of glyphs for each syllable, or a combination of the two. 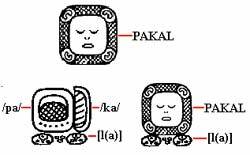 Pakal is the Maya word for shield. The figures in the niches were kings — not gods. These were real people, real places, and real events. The Mayas were recording their past. This was their history. And a bloody history it has turned out to be. There are tales of artfully plotted wars, of battles and the capture of prisoners, of kings dying at their enemies' hands in ritual sacrifice. They have altered our idea of the Mayas from a peace-loving people, ruled by contemplative kings and astronomer-priests, to a collection of fiercely warring city-states. The influence of ancient Mesoamerica continues to be felt today. 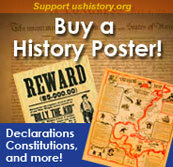 Mesoweb brings you the latest news from Maya and Aztec archaeology, complete with breathtaking images. A series of interesting articles (including "Palenque" and "Life and Death in Ancient Mexico") bring the accumulated smarts of archaeologists from the dig site right to your screen. Rediscovered at the end of the 18th century, the architecture and hieroglyphs of Palenque set it apart from other Maya sites of the classic era. The University of Virginia has compiled a database of thousands of Maya glyphs. This is an advanced research website, making it very difficult to understand without training in the Maya language. However, the Epigraphic Database has a ton of great images and their translations. Head towards the "Glyph Catalogue" and just click on any link in the left margin to see examples of the glyphs found in Maya architecture. Check out the status of the four most important texts in Maya history, the Dresden, Paris, Madrid, and Grolier codices. Originally made from tree bark, flattened and folded in accordion-style, these documents have told researchers much about the history, language, and calendar of the Mayas. An archaeologist explains how we learned about the Mayas through their writing. So much of Maya literature was destroyed during the Spanish invasion because the Spanish considered it "the devil's work." Other texts rotted in the ground during the years before Maya culture was rediscovered. We may only know a fraction about the civilization of the Mayas. How much more would scholars know had other ancient texts survived? Epigraphists (those who study engraved inscriptions) have their hands full deciphering Maya language. They have made important discoveries, but not everyone is impressed. Find out why. Maya writing is possibly the most advanced form of writing developed in ancient Mesoamerica. 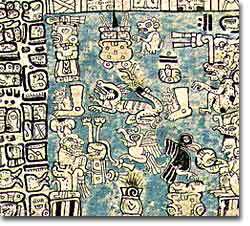 Over 800 glyphs represent different aspects of Maya culture, from mathematics and calendrics to kings, gods, and food. About 85 percent of the known Maya glyphs have been deciphered, but there is still much more to learn. Find out about the Maya codices and other books. Links and images illustrate this unique system of writing.